Brave Software, the company behind the privacy-oriented browser and blockchain-based advertising platform, and Never Stop Marketing Research have released a new study — the Blockchain MarTech Landscape — that illustrates the rapid growth of blockchain solutions for marketers. According to the companies, the number of marketing startups focused on blockchain-based solutions has grown from 22 in third-quarter 2017 to 290 today. Many of the solutions built by those entities are now entering testing phases. The companies included growth stats across martech companies that are harnessing blockchain from February 2018 to February 2019. The report marks a 200% growth for advertising and promotion, a 533% growth for content marketing, a 490% growth for commerce and 533% growth for management. 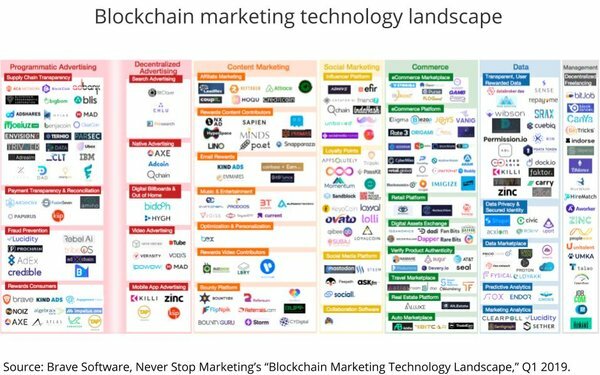 The Blockchain Martech Landscape is divided into columns that include programmatic advertising, decentralized advertising, content marketing, social marketing, commerce, data and management, while the companies featured in each column are organized based on the type of solution they provide. For example, under the Programmatic Advertising category, solutions include supply chain transparency, payment transparency and reconciliation, fraud prevention and rewarding consumers (for their attention). For its part, Brave has expanded its portfolio of offerings and introduced a new blockchain-based advertising model called Brave Ads. The new model gears 70% of revenue share to users. The technology was introduced in January 2018 and will become available with the launch of the Brave 1.0 browser release. Early ad network and brand partners include BuySellAds, TAP Network, AirSwap, Fluidity and Uphold. Last spring, Townsquare Media underwent a trial with Brave to test out its blockchain-based advertising. Prior to the trail, Brave announced a partnership with Dow Jones Media Group and that more than 12,000 publishers were approved for Brave Attention Token, or BAT, payments, including The Washington Post and The Guardian.